One of America’s premier sports broadcasters for five decades, Marty Glickman was the radio and television playby- play voice of the National Football League’s New York Giants from 1948 to 1971; the American Football League’s New York Jets from 1972 to 1979 and 1987 to 1989; the National Basketball Association’s New York Knickerbockers from 1946 to 1970; pre-game and post-game shows for the (Brooklyn) Dodgers and Yankees for 22 years; and Yonkers Raceway for twelve years. 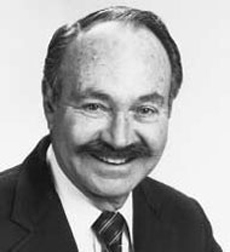 Glickman, whose voice was heard in movie houses throughout the world for 15 years as a sports narrator for the theatrical newsreels Paramount News and News of the Day, was virtually a non-stop on-air reporter. He was heard or seen, or both, as a commentator for major track and field meets, a broad variety of collegiate sporting events, Major League baseball, horse racing, sports highlights and interview shows, and events ranging from six-day bike races and lacrosse to skiing and water polo. Glickman has received numerous honors and awards through the years, among them the Naismith Basketball Hall of Fame’s Curt Gowdy Award in 1991, the National Sportscasters and Sportswriters Hall of Fame in 1992, and the American Sportscasters Hall of Fame in 1993.
third-place bronze medal in the 4 x 100 relay. any of the running events, while the United States captured six golds and four silvers before the 4 x 100 relay. Pundits suggested that perhaps U.S. officials made the relay switch as a token of Hitler-appeasing diplomacy. American track officials steadfastly denied this scenario, yet never offered a plausible explanation. In 1998, William J. Hyde, president of the United States Olympic Committee, citing: “great evidence of anti-semitism was there”, presented Glickman and Stoeller (posthumously–he died in 1983) with a special plaque: “in lieu of the gold medals they didn’t win”. Glickman’s autobiography (with Stan Isaacs), Fastest Kid On The Block, was published in 1996.